The thyroid gland is of pivotal importance to our overall health, but like the majority of other hormones as we age the production of thyroxine by the thyroid drops dramatically. This lack of thyroid function is the root cause of a wide variety of age related health disorders. Supplementation with synthetic or particularly natural thyroids, such as the market leading brand Armour Thyroid can have a significant positive effect on a wide range of age related problems. The hormone produced by the thyroid, thyroxine controls the body’s metabolism, the rate at which it burns calories for energy. It also controls the body’s utilization of fat but a decline in the secretion of hormones from the thyroid gland, known as hypothyroidism can result in far wider symptoms such as poor concentration, confusion, memory problems, cold hands and feet and weight gain (the full list of 47 hypothyroidism symptoms identified by Dr Broda Barnes are available in Dr Ward Deans article ‘Hypothyroidism – The Underdiagnosed Epidemic’ here). Another serious condition which can be caused by and result from an underactive thyroid is the common painful musculoskeletal condition known as fibromyalgia which affects tendons, muscles and ligaments. Some hypothyroidism, clinically diagnosed as thyroid deficiency syndrome, may be caused by a condition called Hashimoto’s thyroiditis. Hashimoto’s thyroiditis is an autoimmune disease in which the body’s own immune defenses turn on the thyroid gland, causing an inflammatory process that eventually destroy it, 90% of the sufferers of Hashimoto’s thyroiditis are women. How Can I Be Sure I Need Thyroid Armour Supplements? It is easy to test your thyroid levels by measuring levels of Thyroid Stimulating Hormone (TSH) in the blood. It is worth checking your TSH levels from time to time, as this can indicate if thyroid supplements you are using are returning your thyroxine to more youthful levels. Another, simpler method is by taking your body temperature when you wake in the morning. It should be in the range of 97.8 to 98.2 degrees Fahrenheit if not then you should consult a doctor about supplementing with thyroid. At antiaging-systems.com we stock a comprehensive range of both synthetic and natural thyroids, but would strongly advocate taking a natural supplement over a synthetic because products such as Armour Thyroid contain the full spectrum of Thyroid hormones (T1, T2, T3 and T4) unlike synthetic thyroid products such as Titre or Tiromel, which typically only contain one. However most mainstream doctors only prescribe synthetic thyroids, so for those who are looking to fulfil their prescription we offer them. We also have the first synthetic T3 and T4 combination IBSA from Italy. 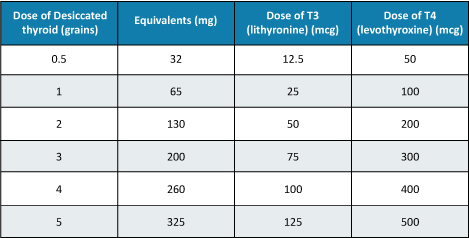 This table, below, was provided by ERFA Thyroid themselves, and proivdes a helpful little guide to what the suggested conversion rates are for those wishing to make the switch between synthetic thyroids and natural versions. As always we recommend consulting with a physician for anything you are not entirely sure about! Natural thyroids are measured in grains and we carry the popular Armour Thyroid brand in grains from ¼ grain to 2 grain. As well as the ERFA Thyroid and Nature Thyroid products in grains from ½ grain to 2 grain. All our natural thyroid supplements are of porcine origin. How Much Thyroid Should I Take? Dosages of whole thyroid extracts depend on your age and thyroid condition. As a rough guide, 15mg to 30mg daily increasing to 60mg daily after a couple of weeks if necessary. If you are over 40 years of age and have no overt endocrine disease just a small regular whole thyroid supplement can raise energy levels, improve bowel function and cognitive function. Almost every aging individual would benefit from taking a natural whole thyroid supplement because this remarkable hormone has such a profound affect across so many different conditions, we consider it an essential part of any serious attempt to increase a person’s health span and longevity. What is the difference between Westhroid® and Nature-throid® supplements which are both made by RLC labs? According to the makers- RLC Labs, their brands of natural porcine thyroids- Westhroid® and Nature-throid® are hormonally IDENTICAL -they both contain the same thyroid composition and excipients, the only difference is the binding ingredient. However, the brand Westhroid® appears to be no longer in the maker’s catalog, instead it seems to have been transformed into WP-Thyroid® which contains the additions of inulin, (from chicory root) and medium chain triglycerides (from coconut). I have an under active thyroid and take 175 mcg of Eutroxsig thyroxine tablets every day. Can you tell me the right natural tablet in replacement please? Regarding transference from synthetic thyroids to natural thyroids, (including time scale and gradual switching from one to the other), this quote is taken from Dr. Lippman’s article at: Thyroid and adrenals. You may also find Dr. Wilkinson’s thyroid article interesting also: Thyroid An Important Yet Underutilized Antiaging Hormone. Note: 1 grain of natural thyroid is equivilant to 60 mg.
Eutroxsig® is levothyroxine (T4) therefore according to Dr. Lippman’s formula the average patient would equivocate 175 mcg of T4 into 1.75 grains of natural thyroid which is a dose equivilant to 105 mg. Individual natural thyroid tablets come in sizes of 15, 30, 60, 90, 120 and 125 mg. Therefore, your end-dose is best taken as a 90 mg and a 15 mg tablet and ARMOUR® is available in both of these sizes. Of course, you may need to use different tablet dose combinations in the early weeks if you and your doctor follow Dr. Lippman’s switch over information (as above). I am currently taking synthetic thyroid but wish to move to a natural thyroid, what dosage of the natural thyroid supplement is equal to the synthetic version? This is a difficult question to answer, at least to be precise because there is no standardized equivalent about transferring from a synthetic thyroid to a natural one, much depends on the blood work and how you feel. One of the issues that can cause complication is that Synthetic Thyroids such as Synthroid® only contain T4, this has to be converted inside the body into T3 the active form of thyroid; however for some patients this process is sometimes poor and therefore leads to lower than required T3 levels. However as a natural thyroid such as Armour® contains all 4 thyroid hormones (T1, T2, T3 and T4), it means that the body doesn’t need to ‘struggle’ to convert into T3 etc. And it is one of the reasons why Armour® and other natural Thyroid supplements are considered by many to be superior products. A good expression of an active thyroid is body temperature. Take your temperature upon rising from bed, over a couple of weeks it should be in the range of 97.8 to 98.2 degrees Fahrenheit, if it is regularly less than that it could be that a little more thyroid is required, if more than that then perhaps less thyroid is required. However as Dr. Ward Dean says, “don’t treat the blood, treat the patient” so sometimes a little more thyroid can overcome low energy, poor temperature control, poor sleep etc. However you should ensure that your resting pulse rate does not rise above 65-75 beats per minute. Dr. Thierry Hertogue recommends that the synthetic thyroid is (ideally) reduced by a quarter each week and that the natural thyroid is introduced by a quarter dose each week, therefore within a month the Thyroids are switched. A typical regime would be in week 1 the levothyroxine is reduced to 75mcg (I appreciate that tablets are often 50mcg but that would be 1 ½ tablets) and introduce Armour at 15mg. Week 2 levothyroxine 50mcg and Armour 30mg, week 3 levothyroxine 25mcg and Armour 45mg, week 4 levothyroxine 0mcg and Armour 60mg and thereafter 60mg daily. This regime is of course dependent upon body temperature, blood tests and the health of the patient. It may be that your final natural thyroid dose will be slightly lower or higher than 60mg – but that is the typical average dose for a patient. Should natural thyroids be taken on an empty stomach or with food? There are no specific instructions from the manufacturer, but most products are fat soluble and therefore best taken with food, this is also likely to be the case with the Armour® thyroid. Is it a good idea to take a break my thyroid treatment from time to time? It is believed to be generally good practice with most types of medications, particularly hormones to give occasion breaks or alterations to the patterns and dosages etc. Thyroid is a hormone that is particularly prone to potential ‘down regulation.’ In other words, over doing the supplementation can cause permanent lack of production of natural thyroid. However, this is rare when it comes to a natural thyroid such as Armour®, Nature® or ERFA® because the synthetics only contain T3 or T4. Marios Kyriazis M.D. wrote a piece about why differing / uneven supplementation (for all supplements – not just thyroid) may be beneficial and gave a strong scientific argument with references in the Journal of Antiaging Medicine which is now called Rejuvenation Research although there isn’t a definitive clinical proof for it. *Reprints can be ordered here. Please note that abstracts are not available free of charge. I have been taking Synthroid® 0.112 mg. Which is the closest one? Synthroid® is T4; the closest match we have is Eutirox® in 100 mcg tablets (0.100 mg). However you may want to read some of our articles about thyroid and consider a natural replacement here. I received an order of Armour thyroid from you a couple of weeks ago and there are a couple of questions I would like to ask. First, I am currently taking 100 mg of levothyroxine (T4) daily. Can you tell me what dosage I should take of Armour thyroid? Also, should I start with a lower dose of Armour or start with the equivalent of what I am taking now? Also, should I take the required dosage once a day or divide it into two doses? I take quite a lot of vitamins, minerals and other supplements. Do I need to take these at a different time from Armour thyroid? Unfortunately there is no exact science in transferring from a synthetic thyroid to a natural one; much depends on the blood work and how you feel. A good expression of an active thyroid is body temperature. Take your temperature upon rising from bed it should be in the range of 97.8 to 98.2 degrees Fahrenheit, if it is less than that it could be that a little more thyroid is required, if more than that then perhaps less thyroid is required. However as my good friend Dr. Ward Dean says, “don’t treat the blood; treat the patient” so sometimes a little more thyroid can overcome low energy, poor temperature control, poor sleep etc. However you should ensure that your resting pulse rate does not rise above 65-75 beats per minute. Dr. Thierry Hertogue recommends that the synthetic thyroid is (ideally) reduced by a quarter each week and that the natural thyroid is introduced by a quarter dose each week, therefore within a month the drugs are switched. Therefore a typical regime would be in week 1 the levothyroxine is reduced to 75mcg (I appreciate that tablets are often 50mcg but that would be 1 ½ tablets) and introduce Armour® at 15mg. Week 2 levothyroxine 50mcg and Armour 30mg, week 3 levothyroxine 25mcg and Armour 45mg, week 4 levothyroxine 0mcg and Armour 60mg and thereafter 60mg daily. This regime is of course dependent upon body temperature, blood tests and the health of the patient. It may be that your final natural thyroid dose will be slightly lower or higher than 60mg- but that is the typical average dose for a patient. Armour® is best taken in the morning; some believe that chewing the tablet carefully is the best way to take it. There are no known complications taking it with other vitamins/ nutrition. I now take 100 mcg of Synthroid® every day. I want to take a similar amount of Armour®. Could your experts advise me on how much Armour I should take a day to be approximately equal? It is a difficult question to answer, at least to be precise because there is no standardized equivilant. One of the issues that causes the complication is that Synthroid® ‘only’ contains T4, this has to be converted inside the body into T3 the active form of thyroid, however for some patients this process is sometimes poor and therefore leads to lower than required T3 levels. However as Armour® contains all 4 thyroid hormones (T1, T2, T3 and T4), it means that the body doesn’t need to ‘struggle’ to convert into T3 etc. And it is one of the reasons why Armour is considered by many to be a superior product. “In the 1940s, Dr. Barnes realized that the blood tests were usually inaccurate. Consequently, he developed a simple test to confirm suspected low thyroid function using an ordinary thermometer. He found that normal underarm or oral temperatures immediately upon awakening in the morning (while still in bed) are in the range of 97.8 to 98.2 degrees Fahrenheit. He believed that a temperature below 97.8 indicated hypothyroidism; and one above 98.2, hyperthyroidism (overactive thyroid). Dr. Barnes recommended that the underarm temperature taken immediately upon awakening be used to diagnose hypothyroidism. Unfortunately, even today’s highly sophisticated tests are no more accurate than the tests used in Dr. Barnes’ era. Therefore, I instruct my patients to take their temperature orally (as opposed to underarm) immediately upon awakening in the morning as a guide to diagnosis and treatment of hypothyroidism. At the same time I have my patients check their resting pulse rate which should be between 65 and 75. If a patient exhibits hypothyroidism symptoms and his temperature is below 97.8 Fahrenheit, I prescribe one grain (60 mg) of Armour Desiccated Thyroid daily. If no improvement is noted in two or three weeks, I instruct him to increase the dose by another grain. At each step, we monitor morning temperature and heart rate. If the suspected hypothyroid symptoms are still present and the temperature is still sub-normal, it is safe to continue to increase the dosage provided that the patient’s heart rate goes no higher than the mid-70s, and no symptoms of hyperthyroidism are evident, (agitation, anxiety, poor sleep, tremor of hand, palpitations). Treatment of subclinical hypothyroidism with thyroid hormone is very safe. There is little risk of excessive thyroid dosage if: (1) the patient feels well; (2) the temperature remains below 98.2; (3) the pulse is less than 75 beats per minute; and (4) the thyroid function tests remain normal. (Note that most hypothyroid patients feel best with sub-normal TSH levels). With this in mind and considering that your current Synthroid® medication is low-mid range in its dose, you may want to start as Dr. Dean suggests at 1-grain (60mg) of Armour® and monitor the situation to see if more is required. Please note that Armour is now also available in 90mg tablets, which means there is now a step between 1 and 2 grains (which probably wasn’t around when Dr. Dean wrote said article). Can I ask you one more question? It is in relation to taking vitamins, minerals and other supplements. The synthetic thyroid I am currently taking says I should not take vitamins etc., within 4 hours of taking thyroid – does this advice also apply to Armour® thyroid? I can’t imagine why the synthetic thyroid manufacturers make that case? Unless they have concerns that some of the vitamins will contain iodine (or iodide) that could lead to an increased thyroid release; however this is only likely to be the case if both the thyroid dose and the vitamin doses are high. We see no harm in taking both Armour® and vitamins together at more or less the same time. I do! One tip is that chewing the Armour tablet carefully helps to get some it of sublingually, therefore faster into the bloodstream – in my opinion there is virtually no flavor to them so it is not unpleasant. Should thyroid be taken on an empty stomach or with food? If with food, is it better with carbs or protein? There are no specific instructions from the manufacturer, but most products are fat soluble and therefore best taken with food, this is also likely to be the case with the Armour® thyroid. A heavy protein meal may be best avoided. We hope this helps. One grain (equivalent to 60mg) or higher dosages are potent and usually require temperature monitoring and occasional blood tests. Persons with more-serious thyroid conditions are often be prescribed one grain. Dosages under a physician’s guidance can often reach three to five grains daily. Dosages of more than one grain are usually increased by a grain over one to two weeks. Quarter grain and half grain whole thyroid supplements (15mg to 30mg)) provide less potency and are used to support an aging thyroid condition. However, long-term use of low dose whole thyroid extracts may also require occasional breaks and monitoring. Reduce or stop thyroid supplementation if you feel unwell, your rising-from-bed-in-the-morning temperature is over 98.2 degrees Fahrenheit, your resting pulse is more than 75 beats a minute or your thyroid function blood tests are abnormal. Nature-Throid™ (Thyroid USP) Tablets, micro-coated, easy to swallow with a reduced odor, for oral use are natural preparations derived from porcine thyroid glands (T3 liothyronine is approximately four times as potent as T4 levothyroxine on a microgram for microgram basis). They provide 38 mcg levothyroxine (T4) and 9 mcg liothyronine (T3) for each 65 mg (1 Grain) of the labeled content of thyroid. Microcrystalline Cellulose, Croscarmellose Sodium, Stearic Acid, Opadry II 85F19316 Clear. As replacement of supplemental therapy in patients with hypothyroidism of any etiology, except transient hypothyroidism during the recovery phase of subacute thyroiditis. This category includes cretinism, myxedema, and ordinary hypothyroidism in patients of any age (children, adults, the elderly), or state (including pregnancy); primary hypothyroidism resulting from functional deficiency, primary atrophy, partial or total absence of thyroid gland, or the effects of surgery, radiation, or drugs, with or without the presence of goiter; and secondary (pituitary), or tertiary (hypothalamic) hypothyroidism. As pituitary TSH suppressants, in the treatment or prevention of various types of euthyroid goiters, including thyroid nodules, subacute, or chronic lymphocytic thyroiditis (Hashimoto’s), multinodular goiter, and in the management of thyroid cancer. As diagnostic agents in suppression tests to differentiate suspected mild hyperthyroidism or thyroid gland anatomy. Thyroid hormone preparations are generally contraindicated in patients with diagnosed, but as yet, uncorrected adrenal cortical insufficiency, untreated thyrotoxicosis, and apparent hypersensitivity to any of their active or extraneous constituents. There is no well documented evidence in the literature of true allergic or idiosyncratic reactions to thyroid hormone. Drugs with thyroid hormone activity, alone or together with other therapeutic agents, have been used for the treatment of obesity. In euthyroid patients, doses within the range of daily hormonal requirements are ineffective for weight reduction. Larger doses may produce serious or even life threatening manifestations of toxicity, particularly when given in association with sympathomimetic amines such as those used for their anorectic effects. The use of thyroid hormones in the therapy of obesity, alone or combined with other drugs, is unjustified and has been shown to be ineffective. Neither is their use justified for the treatment of male or female infertility unless this condition is accompanied by hypothyroidism. Thyroid hormones should be used with great caution in a number of circumstances where the integrity of the cardiovascular system, particularly the coronary arteries, is suspected. These include patients with angina pectoris or the elderly, whom have a greater likelihood of occult cardiac disease. With these patients, therapy should be initiated with low doses, i.e. 16.25 – 32.5 mg. When, in such patients, a euthyroid state can only be reached at the expense of an aggravation of the cardiovascular disease, thyroid hormone dosage should be reduced. Thyroid hormone therapy in patients with concomitant diabetes mellitus or diabetes insipidus or adrenal cortical insufficiency aggravates the intensity of their symptoms. Appropriate adjustments of the various therapeutic measures directed at these concomitant endocrine diseases are required. The therapy of myxedema coma requires simultaneous administration of glucorticoids.Hypothyroidism decreases and hyperthyroidism increases the sensitivity to oral anticoagulants. Prothrombin time should be closely monitored in thyroid treated patients on oral anticoagulants and dosage of the latter agents should be adjusted on the basis of frequent prothrombin time determinations. In infants, excessive doses of thyroid hormone preparations may produce craniosynostosis. Replacement therapy is to be taken essentially for life, with the exception of cases of transient hypothyroidism, usually associated with thyroiditis, and in those patients receiving a therapeutic trial of the drug. They should immediately report, during the course of therapy, any signs or symptoms of thyroid hormone toxicity, e.g., chest pain, increased pulse rate, palpitations, excessive sweating, heat intolerance, nervousness, or any other unusual event. In case of concomitant diabetes mellitus, the daily dosage of antidiabetic medication may need readjustment as thyroid hormone replacement is achieved. If thyroid medication is stopped, a downward readjustment of the dosage of insulin or oral hypoglycemic agent may be necessary to avoid hypoglycemia. At all times, close monitoring of urinary glucose levels is mandatory in such patients. In case of concomitant oral anticoagulant therapy, the prothrombin time should be measured frequently to determine if the dosage of oral anticoagulants is to be readjusted. Partial loss of hair may be experienced by children in the first few months of thyroid therapy, but this is usually a transient phenomenon and later recovery is usually the rule. Oral Anticoagulants-Thyroid hormones appear to increase catabolism of vitamin K- dependent clotting factors. If oral anticoagulants are also being given, compensatory increases in clotting factor synthesis are impaired. Patients stabilized on oral anticoagulants that are found to require thyroid replacement therapy should be watched very closely when thyroid is started. If a patient is truly hypothyroid, it is likely that a reduction in anticoagulant dosage will be required. No special precautions appear to be necessary when oral anticoagulant therapy is begun in a patient already stabilized on maintenance thyroid replacement therapy. Insulin or Oral Hypoglycemic-Initiating thyroid replacement therapy may cause increases in insulin or oral hypoglycemic requirements. The effects seen are poorly understood and depend upon a variety of factors such as dose and type of thyroid preparations and endocrine status of the patient. Patients receiving insulin or oral hypoglycemic should be closely watched during initiation of thyroid replacement therapy. Cholestyramine or Colestipol- Cholestyramine or Colestipol binds both levothyroxine (T4) and liothyronine (T3) in the intestine, thus impairing absorption of these thyroid hormones. In vitro studies indicate that the binding is not easily removed. Therefore, four to five hours should elapse between administration of Cholestyramine or Colestipol and thyroid hormones. levothyroxine (T4) may be decreased when estrogens are started thus increasing thyroid requirements. However, if the patient’s thyroid gland has sufficient function, the decreased free levothyroxine (T4) will result in a compensatory increase in levothyroxine (T4) output by the thyroid. Therefore, patients without a functioning thyroid gland who are on thyroid replacement therapy, may need to increase their thyroid dose if estrogens or estrogen-containing oral contraceptives are given. Category A: Thyroid hormones do not readily cross the placental barrier. The clinical experience to date does not indicate any adverse effect on fetuses when thyroid hormones are administered to pregnant women. On the basis of current knowledge, thyroid replacement therapy to hypothyroid women should not be discontinued during pregnancy. Nursing Mothers: Minimal amounts of thyroid hormones are excreted in human milk. Thyroid is not associated with serious adverse reactions and does not have a known tumorigenic potential. However, caution should be exercised when thyroid is administered to a nursing woman. serumT4 and/or TSH is strongly advised in neonates in view of the deleterious effects of thyroid deficiency on growth and development. Treatment should be initiated immediately upon diagnosis, and maintained for life, unless transient hypothyroidism is suspected; in which case, therapy may be interrupted for 2 to 8 weeks after the age of 3 years to reassess the condition. Cessation of therapy is justified in patients who have maintained a normal TSH during those 2 to 8 weeks. Geriatric use: Clinical studies of Thyroid Tablets, USP did not include sufficient numbers of subjects aged 65 and over to determine whether they respond differently from younger subjects. Other reported clinical experience has not identified differences in responses between the elderly and younger patients. In general, dose selection for an elderly patient should be cautious, usually starting at the low end of the dosing range, reflecting the greater frequency of decreased hepatic, renal, or cardiac function, and of concomitant disease or other drug therapy. Adverse reactions other than those indicative of hyperthyroidism because of therapeutic overdosage, either initially or during the maintenance period, are rare. Signs and Symptoms: Excessive doses of thyroid result in a hypermetabolic state resembling in every respect the condition of endogenous origin. The condition may be self induced. Dosage should be reduced or therapy temporarily discontinued signs and symptoms of overdosage appear. Treatment may be reinstituted at a lower dosage. In normal individuals, normal hypothalamic-pituitarythyroid axis function is restored in 6 to 8 weeks after thyroid suppression. Treatment of acute massive thyroid hormone overdosage is aimed at reducing gastrointestinal absorption of the drugs and counteracting central and peripheral effects, mainly those of increased sympathetic activity. Vomiting may be induced initially if further gastrointestinal absorption can reasonably be prevented and barring contraindications such as coma, convulsions, or loss of the gagging reflex. Treatment is symptomatic and supportive. Oxygen may be administered and ventilation maintained. Cardiac glycosides may be indicated if congestive heart failure develops. Measures to control fever, hypoglycemia, or fluid loss should be instituted if needed. Antiadrenergic agents, particularly propranolol, have been used advantageously in the treatment of increased sympathetic activity. Propranolol may be administered intravenously at a dosage of 1 to 3 mg, over a 10 minute period or orally, 80 to 160 mg/day, initially, especially when no contraindications exist for its use. The dosage of thyroid hormones is determined by the indication and must in every case be individualized according to patient response and laboratory findings. myxedema coma, or during parenteral nutrition). Intramuscular administration is not advisable because of reported poor absorption. Therapy is usually instituted using low doses, with increments which depend on the cardiovascular status of the patient. The usual starting dose is 32.5 mg, with increment of 16.25 mg every 2 to 3 weeks. A lower starting dosage, 16.25 mg/day, is recommended in patients with longstanding myxedema, particularly if cardiovascular impairment is suspected, in which case extreme caution is recommended. The appearance of angina is an indication for reduction in dosage. Most patients require 65 – 130 mg/day. Failure to respond to doses of 195 mg suggests lack of compliance or malabsorption. Maintenance dosages 65 – 130 mg/day usually result in normal serum T4 and T3 levels. Adequate therapy usually results in normal TSH and T4 levels after 2 or 3 weeks of therapy. Readjustment of thyroid hormone dosage should be made within the first four weeks of therapy, after proper clinical and laboratory evaluations, including serum levels of T4, bound and free, and TSH. intercurrent illness or drugs such as sedatives and anesthetics and should be considered a medical emergency. Therapy should be directed at the correction of electrolyte disturbances and possible infection, besides the administration of thyroid hormones. Corticosteroids should be administered routinely. Levothyroxine (T4) and Liothyronine (T3) may be administered via a nasogastric tube, but the preferred route of administration of both hormones is intravenous. Levothyroxine sodium (T4) is given at a starting dose of 400 mcg (100 mcg/mL) given rapidly, and is usually well tolerated, even in the elderly. This initial dose is followed by daily supplements of 100 to 200 mcg given IV. Normal T4 levels are achieved in 24 hours, followed in 3 days by threefold elevation of T3. Oral therapy with thyroid hormone would be resumed as soon as the clinical situation has been stabilized and the patient is able to take oral medication. Exogenous thyroid hormone may produce regression of metastases from follicular and papillary carcinoma of the thyroid and is used as ancillary therapy of these conditions with radioactive iodine. TSH should be suppressed to low or undetectable levels. Therefore, larger amounts of thyroid hormone than those used for replacement therapy are required. Medullary carcinoma of the thyroid is usually unresponsive to this therapy. Administration of thyroid hormone in doses higher than those produced physiologically by the gland results in suppression of the production of endogenous hormone. This is the basis for the thyroid suppression test and is used as an aid in the diagnosis of patients with signs of mild hyperthyroidism, in whom base line laboratory tests appear normal, or to demonstrate thyroid gland autonomy in patients with Grave’s ophthalmopathy. 131I uptake is determined before and after the administration of the exogenous hormone. A fifty percent or greater suppression of uptake indicates a normal thyroid pituitary axis, and thus rules out thyroid gland autonomy. For adults, the usual suppressive dose of levothyroxine (T4) is 1.56 mg/kg of body weight per day given for 7 to 10 days. These doses usually yield normal serum T4 and T3 levels and lack of response to TSH. Thyroid hormones should be administered cautiously to patients in whom there is strong suspicion of thyroid gland autonomy, in view of the fact that the exogenous hormone effects will be additive to the endogenous source. Pediatric dosage should follow these recommendations. In infants with congenital hypothyroidism, therapy with full doses should be instituted as soon as the diagnosis has been made.